I originally designed this kayak for a customer with a lake house in Wisconsin. He is a fit, athletic guy with almost no experience in a kayak. He wanted something he felt comfortable in, yet which would move along nicely. He really liked the original microBootlegger, but he is single, so he didn't need the tandem ability, but he appreciated the classic lines. With just a slight rake to the stem and stern, this kayak has an almost full length waterline, giving it good speed potential. With a bit of flare and relatively high sides, the Sport has good stability, while still being narrow enough at the waterline to minimize how much water is disturbed as she cuts across the lake. 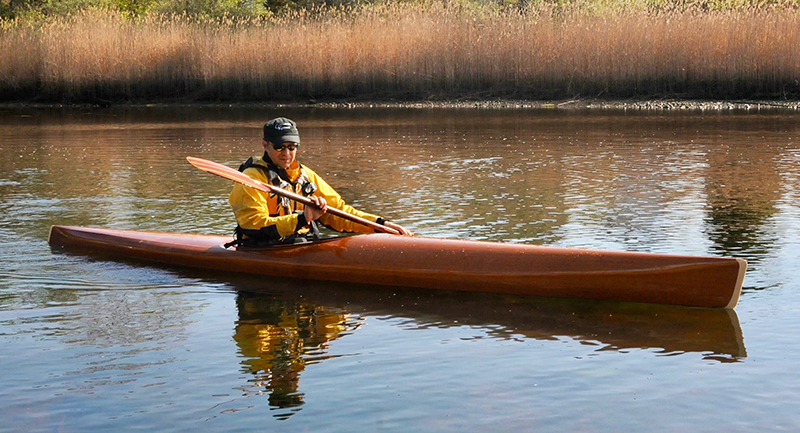 A well designed kayak allows the paddler to have a conversation with the water. More that just traveling over the water, a kayak can let you interact, feel and respond. Although it is a very different kayak from the Petrel, the Sport shares a similar bottom shape. It has a similar transitioning chine that is rounded in front and hard behind. This allows for smooth progress into waves, while providing a positive control surface while working down wind for capable surfing. This kayak will be reassuring to novice kayakers, yet provide exciting performance to a skilled paddler. The recessed cockpit stays out your way and provides a very sophisticated look to the design. It does add a bit of complication to the build, but can be left out to make a very simple build. Most of the strips run pretty straight so it is a good design for experimenting with more difficult woods.